By Shahzad Saeed in E-Commerce. Updated on November 12, 2018 . The money is in the list; we have all heard this lots of times. It is true that your email list can be one of your biggest online assets. However, no matter how big your list is, unless you nurture the leads properly, you won’t succeed in making sales or revenue. Nurturing your leads hugely relies on how engaging your emails are in terms of open rate and clickthrough rate. As the competition grows tougher, and more and more emails are hitting the inbox of an average user, it is harder to get noticed and in turn harder to get the engagement rate increased. Want to know how you could increase the email engagement rate of your email newsletter? There are a lot of ways. Let’s look at a few methods that could work. Fiverr.com is the largest marketplace for buying and selling small services. 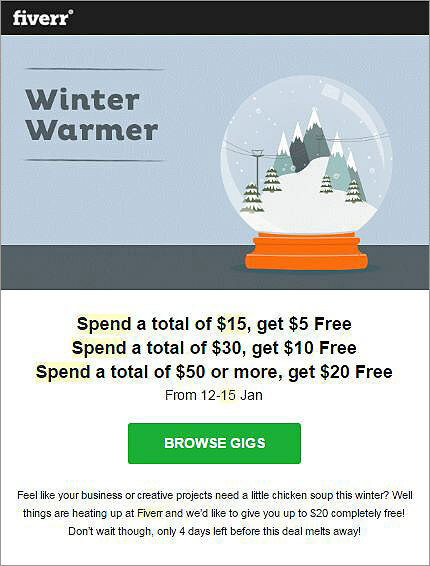 Every week Fiverr sends an email to its active users promoting a series of gigs listed on their marketplace that they believe the user might be interested in. Since the gigs they promote through email are chosen based on the on-site behavior of each individual user, it provides a personalized user experience to the recipients. How would you categorize your customers and prospects according to their behavior and interests, and give your team the capability to add more personalized messages to your campaign? If you’re just getting starting to sell different products via email marketing, the following tips can help you. Choosing an ecommerce platform can make or break your business. To compare between different platforms and to choose the best suited one for your business, take a look at the various e-commerce app reviews or use a recommendation engine like WebAppMeister. With tools like Drip or Marketo, you can segment your leads into specific groups based on the website visits, form data, previous purchases, email response activities etc and send personalized emails that are targeted specifically for each group. According to a Marketing Sherpa study, personalizing emails on the basis of segmentation can increase the email revenue by 50%. Most of your online customers are in the process of filling a need, and may not be interested in a long-term, engaging relationship with your business. That means you need to figure out a way to re-engage those first time customers, so they return often to your website. Flippa is the largest website and domain name buying and selling marketplace. Their email retention strategy is one of the best examples of retaining their existing customers. If a site has not been successfully sold out when it was first placed on listings, after a certain period they offer a free listing of that site on their marketplace. If you’re selling a product on your website, one of the biggest challenges you’ll be facing is to persuade potential customers to buy your product. Creating a sense of urgency (the scarcity principle) can be very effective in such cases. Litmus often creates a sense of urgency in their email campaign to entice users to buy the tickets as soon as possible by letting the subscribers know the exact amount of tickets left for their event. 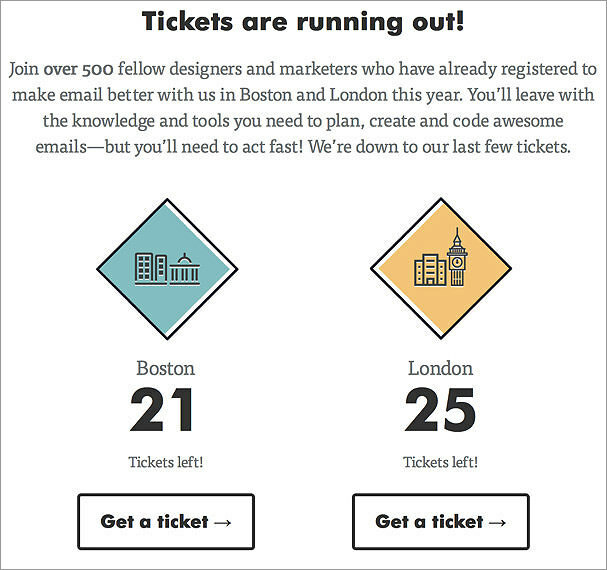 This encourages users to take an immediate action: buy a ticket before they all get sold out. What would you do when a negative action has been taken by your customers such as canceling the premium subscription, unsubscribing from your email list or requesting a refund? It is disappointing when that happens. However, you can convert those negative user actions to making a positive brand perception by sending an awesome email to your leads. 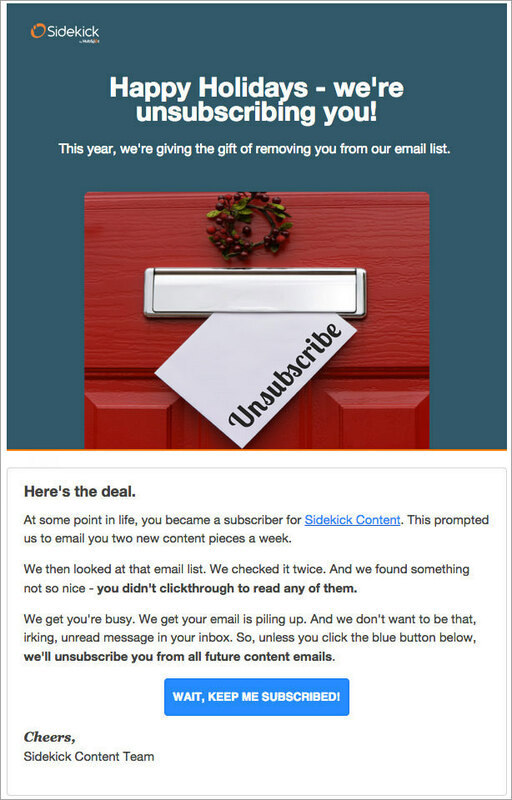 Hubspot’s email unsubscribing message is an example. Their unsubscribing message is so awesome that people would never forget them even after they decided to unsubscribe. Sidekick’s email is yet another example. If a user hasn’t engaged with their email for a while, they’ll send an unsubscription notice saying that they’re being automatically removed from their list but in a "no hard feelings" atmosphere. As a last chance, users can still remain in the list by clicking the ‘keep me subscribed button’. How do you generate more revenue from your online business? For most of us, the answer would be simple. It is by increasing both the traffic and conversion rate. So the equation is, more the number of visitors you convert to customers, the higher the revenue you generate. However, if you’re an e-commerce store, there is another awesome way to increase the revenue of your store. It is by increasing the average order value. 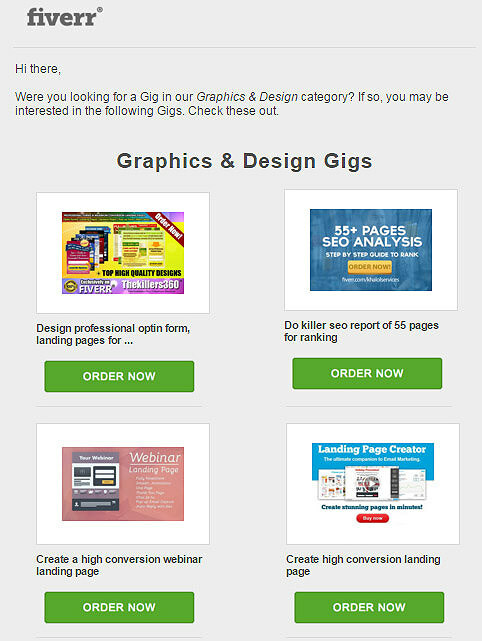 Fiverr offers a special discount of $5 to their selective potential leads who spends $15 on Fiverr. The higher the amount they spend, the higher the discount granted. Personalization is one of the best ways to enhance the engagement rate of your email newsletters. You’ll need to measure the engagement rates for individual email newsletter campaigns, and make sure you test and refine the campaigns on a regular basis. Out of the 5 methods, which one is your favorite email newsletter example? Share your thoughts with us in the comments section. Editor’s Note: This is a written by Shahzad Saeed for Hongkiat.com. Shahzad specializes in content marketing for startups and small businesses. He writes on e-Commerce, marketing, design and CRO. This post is submitted via our Contact Form. Click here to learn more about it.